Making dumplings is so therapeutic. 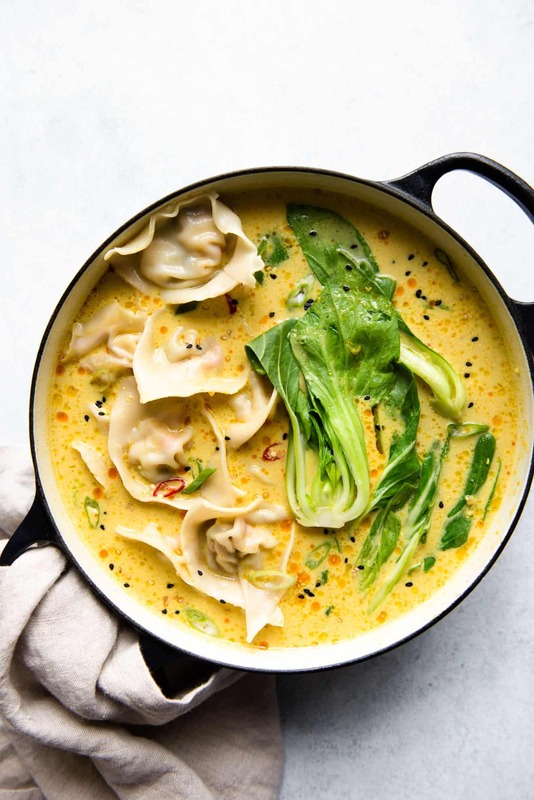 Here’s a simple recipe for a delicious yellow curry wonton soup that is vegetarian. It’s one of my favorite dumpling and broth combinations! When I was in college (my goodness, has it been 10 years already?? ), Mama Lin often made platters of pork dumplings that she froze and bagged for me to take back to school. Like most Asian mothers, Mama Lin worried that I wouldn’t be able to cook for myself once I moved away from home. Whenever I went back to SF for the weekend, she packed my car trunk with so much food. Honestly, I could have fed a family of 5 for an entire week. Making this yellow curry wonton soup reminded me of those college days. 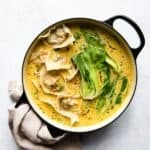 But instead of simply cooking the dumplings in boiling water, I made the dish more sophisticated by serving the wontons with a yellow curry broth. We should always aim higher when we get older, right? 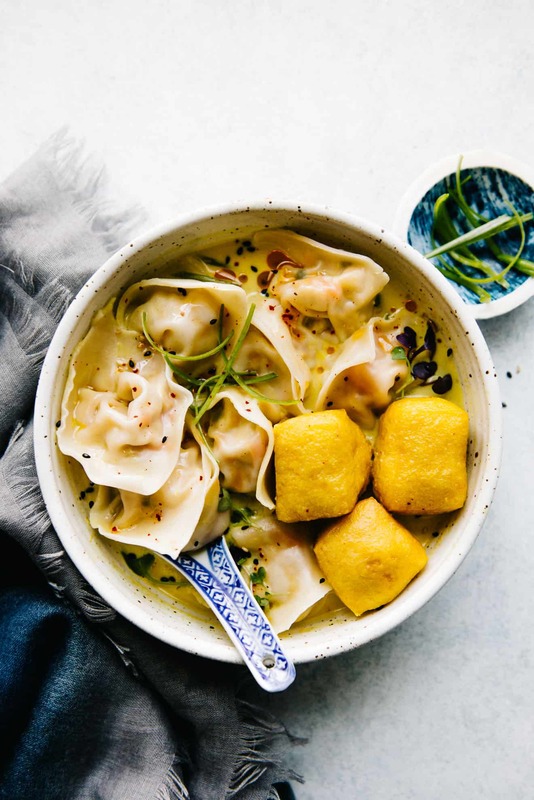 Wontons (雲吞/云吞): Literally translated, “wonton” means swallowing clouds, and it is the Cantonese way of calling these soup dumplings, which float like clouds when they’re done cooking. In Mandarin, this variety of dumplings is called hundun (餛飩/馄炖). Southern-style wontons use thin wrappers for the dumplings, while northern-style hundun use thicker wrappers. Wrappers: I typically buy my wrappers from Asian supermarkets because it is much more convenient than making my own. The brands I use are New Hong Kong Noodle Co. and Wyzen Foods, both of which are based in the Bay Area. If you are shopping in a typical grocery store, you’d probably find Nasoya wrappers. Folding dumplings: For those of you who need visuals, here is the folding technique for the wontons. I also made a video of the folding, which you can watch here. Cooking the dumplings and broth separately: The reason why I cook these separately is because there’s usually a lot of starch sprinkled over the wrappers. If you boil the entire batch of dumplings inside the broth, the starch will release into the broth and can affect the texture of the broth. Place the folded dumplings over a plate and cover with plastic wrap. Make sure that the dumplings do not touch or they might get stuck together. After a few hours, transfer the dumplings to a freezer bag. The freezer will keep in your freezer for months. You can also refer to my post here for more directions on how to freeze dumplings. Whatever you do, DO NOT store the uncooked dumplings in the refrigerator. The moisture from the filling will cause the dumplings to turn soggy, and you’ll end up with a right mess. That’s no good. You can prepare the broth up to 3 days ahead. Refrigerate the broth in jars or large food containers. When you are ready to cook, heat the broth in a pot. In a separate saucepan, boil water and drop the frozen dumplings straight into boiling water. Let the dumplings cook for 6 to 8 minutes. They should float to the top when they are heated through. Do not defrost the dumplings before cooking. Diving the broth and dumplings in bowls to serve. LOOKING FOR MORE DUMPLING RECIPES? You can also visit my complete dumpling archives here. Prepare the Broth: I like preparing the curry broth before making the dumplings because this allows more time for the flavors of the broth to develop. Heat the 1 tablespoon of oil in a pot. Add the minced ginger and garlic and cook for 30 seconds to 1 minute, stirring constantly. Once the ginger and garlic have cooked, add the curry powder and stir to coat the spices. Next, add the vegetable broth and 1/2 teaspoon salt, cover the pot, and bring the broth to boil. Reduce the heat to a simmer and swirl in the coconut milk. Let the broth simmer for about 10 minutes, covered. Turn off the heat and let the broth sit on the stove, covered, as you make the dumplings. Heat 1 1/2 tablespoons of oil in a large pan. Add the minced ginger and garlic and cook for 1 minute. Then, add the cabbage, carrots, and a pinch of salt to the pan and cook for 3 to 4 minutes. Transfer the tofu and scallions to the pan and add another pinch of salt. Cook for another 2 to 3 minutes. Taste the filling. You want the the filling to be a smidgen saltier than you would normally prefer. The wonton wrappers will mellow out the saltiness of the filling. Dip a finger into the bowl of water and wet 2 adjacent sides of the dumpling wrappers. Spoon about 2 teaspoons to 1 tablespoon of filling into the center of the wrapper. If you can fit more filling into the dumpling, great! Seal the wrapper on the diagonal (dry sides over the wet sides) so that you end up with a triangle shape. Press down on the sides to make sure that you have the dumpling properly sealed. You don’t want the filling to release while they’re cooking. Check the curry broth and see whether it’s still warm enough for your liking. If not, heat it up over medium-low heat and keep it simmering on low as you cook the dumplings. *You can also make the broth with a combination of vegetable broth and water. You may need to add a little more salt. I served the wontons with baby bok choy. I cooked it by blanching it in the hot water I used to cook the wontons (the heat was off at this point). It doesn’t take long to cook the baby bok choy—2 to 3 minutes should be enough. THIS WAS AMAZING. I’ve been wanting to make homemade wontons forever and this is my new favorite recipe. Can’t wait to make this one over and over again! I froze some of the leftovers- can I cook them straight from frozen? I have been grilling tofu for awhile but like the simplicity of your recipe. Hm, I’m on an android, and when I scroll down to the recipe card and hit the “print” button, it brings up the page with a printable version of my recipe. Did that not work for you? This was absolutely delicious! I grilled some baby bok choy halves and added one to each bowl, and the whole thing was a real hit. 5 stars! Thank you so much for trying the recipe, Danielle! So glad you enjoyed it! Hi, if I can’t source yellow curry powder .. would yellow curry paste work the same ? Thanks ! Absolutely! For this recipe, I would use 1 to 1 1/2 tablespoons of the curry paste. I find curry pastes to be more gingery than curry powder, which I would enjoy. Made this recipe tonight! It was so delicious!! My husband loves won ton soup he loved this vegan version! Thanks for trying this, Meghan! So glad you and your husband enjoyed this! Can’t wait to try this recipe. The picture shows what appear to be additional spices and vegetables floating in the broth? Could you post what they are? Hi, Jodi. The photo shows bok choy, and the instructions for cooking that is in the notes of the recipe. I also added chili oil, sesame seeds and sliced scallions for garnish, which is listed in the ingredients. They are fried tofu puffs! They’re usually available in Chinese/Asian supermarkets. Made a big batch of these wontons this afternoon following your recipe. Simple yet flavoursome. I added a drizzle of sesame oil to the filling and a generous pinch of pepper. I saved your recipe for next time. Can’t wait to try them in your broth recipe. Thanks! Venetia, thank you so much for making it! Hope you enjoy it!! So I just tried this recipe (but with ground pork, still delicious!) but I could only fit about 1.5 teaspoons NOT tablespoons of filling. Is this a typo or was something wrong with the wrappers I got? They were Banyon Foods brand. They seemed to tear really easy and when I boiled them they became translucent and fragile and often my wontons broke apart in the water, I did have a very roiling boil going. Any thoughts on what went wrong? Hi Andie, sorry the dumplings are causing you a headache! I made these dumplings again, and I think I put somewhere between 2 teaspoons to 1 tablespoon of filling (I will change the recipe). About the tearing in your dumpling wrappers–that could be the result of using thin wrappers. The ones I used were thicker (medium thickness). There’s nothing wrong with using thin wrappers, but they usually cook in just 3 or 3 1/2 minutes. The longer you leave the wontons in the boiling water, the more likely the dumplings will burst. Also, when you are sealing the dumplings, make sure to get the air pockets out. Hope this helps! Let me know if you have any more questions! I have one more note on this. When using thinner wrappers with a meat filling, I’d err on the side of using less filling (i.e. 1.5 teaspoons is great). Because the wrappers can’t withstand too much heat, you’ll need to pull them out quicker, but you also want to make sure that the meat is fully cooked. Does that make sense? Ah, those adjustments helped a lot, thank you! Also, and I feel bad about this, in all my earlier complaining I forgot to say just how DELICIOUS the curry broth is! No worries! Glad you enjoyed it! This was incredible! I couldn’t stop eating it! I made my family a standard American dinner of meatloaf, Mac and cheese, and broccoli per their request. I do not eat that kind of food. 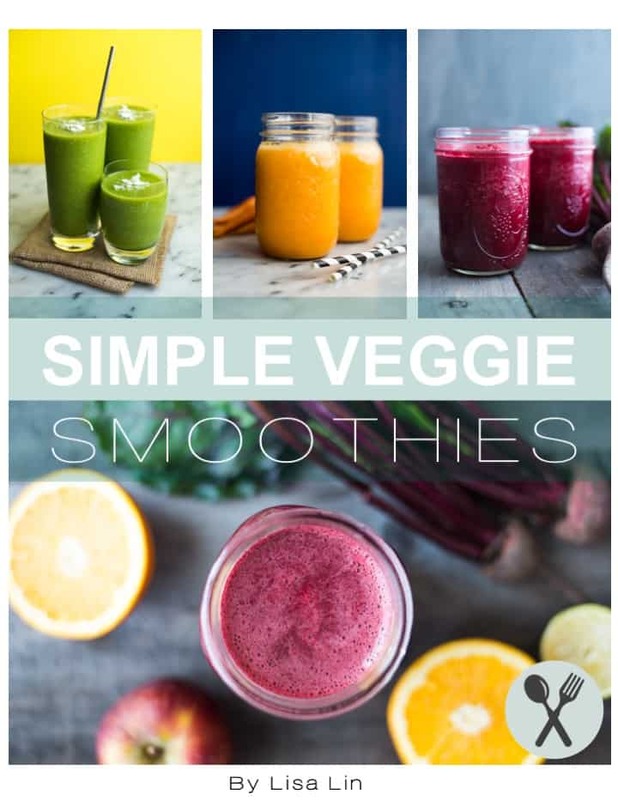 So, I thought I will attempt this simple recipe I saw on Pinterest earlier today. Well, I was blown away by the broth 3 minutes into simmering and it only got better! My children kept coming into the kitchen looking into the pot saying what’s that delicious smell? Or they would claim a stop close to stove and say I’m staying in the delicious aroma. Once I was done making the dumplings and serving myself a bol while their food finished up in the oven, I was suddenly swarmed by three boys asking for a bite. Sure enough they soon had their own bowls lined up next to mine. The meatloaf dinner went in Tupperware for another night minus my husband’s plate of food for the night. Needless to say the recipe was enjoyed by many of the individuals in my home. Side note I added veggies to bulk up the meal and add some nutritional elements (spinach, zucchini, onions, and mushrooms). Also, I added some mushrooms and seasonings to the inside of my dumplings just to customize to my tastebuds. The broth is a for sure keeper and I will always have the ingredients on hand. Erin, thank you so much for trying out the recipe!! I am so, so glad that you and your family enjoyed it!! See if your children want to make the dumplings with you next time (even if they make one)! Thanks again–this note made my evening! This recipe was delicious! I love the broth so much that it has now become a staple that I frequently make and add different vegetables and other ingredients to. 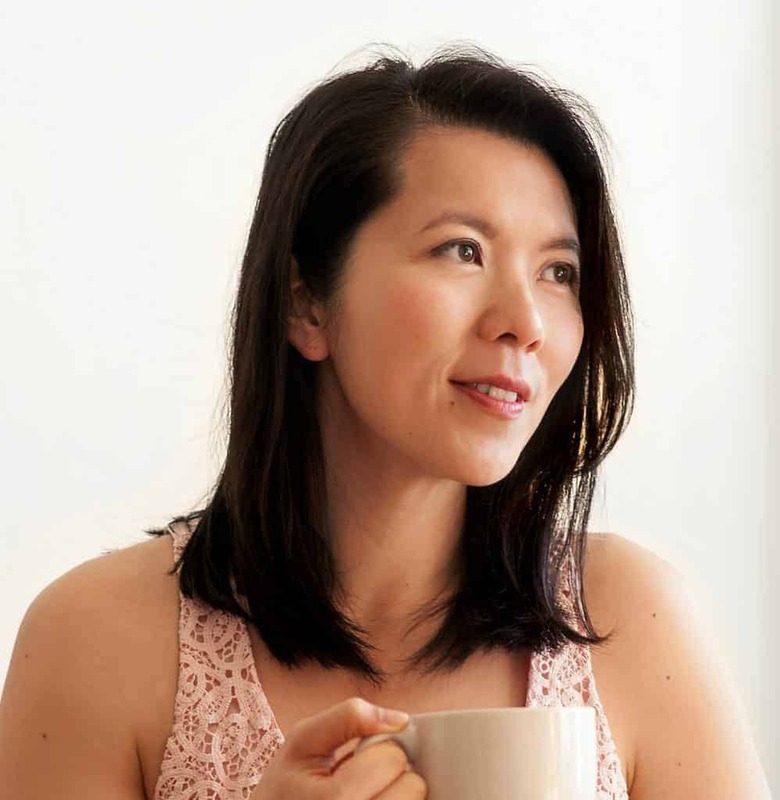 I’ve recently started tracking my food intake to help with fitness goals, so I’ve been trying to figure out the nutritional information of this broth on it’s own. Do you know what it is? I saw this on your Instagram and decided to try! This was amazing, the broth was sooo delicious! I boiled the dumplings too harshly, going to try again more gently. Thanks for the vegetarian recipe, I can’t wait for more!